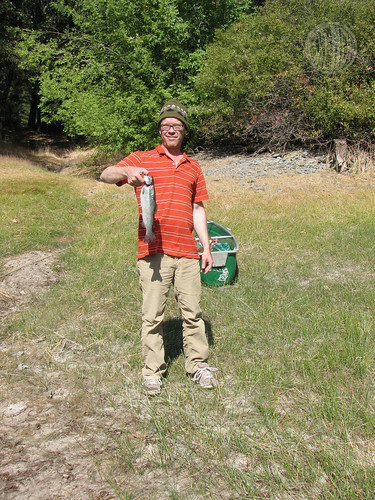 Here’s a little highlight from our trip: Toby caught a fish, a trout. Actually he caught a lot of fish—maybe twenty a day. But on the first day he caught a fish, we took it home and he cooked it. He fried it up in about a pound of butter and some sliced apples that he picked off a tree that was growing by the cabin. He said he wanted to eat a meal that came from the lake. More power to him. Personally, I do not like fish. But to be a good sport I tried a bite. I figured it couldn’t be that bad since it was fried in all that butter. Surely the butter would at least taste good. It did not. It tasted like swamp. I suppose it didn’t help that I had seen what was inside the fish when he cleaned it. Some seeds, bugs and a shiny Lifesaver wrapper. I don’t know, something about a fish eating trash just doesn’t do it for me. 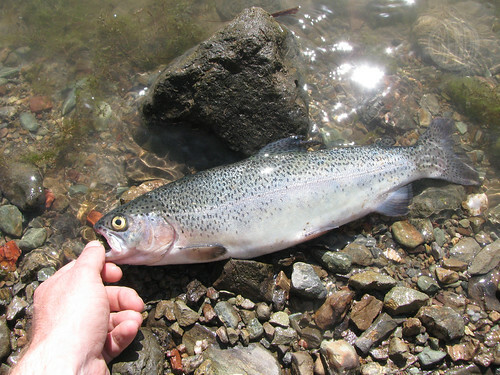 But then it could also be that trout are just fishy fish and I do not like the taste of fish. Anyway, at least I tried it. After Toby ate the fish he admitted that it wasn’t all that good. Hmph, I thought. He could have told me that before I tried a bite. Oh well. That’s what camping is all about I guess. At least if I ever get stranded out in nature some day and I’m forced to fish to stay alive, I’ll know that horrible taste is totally normal and I won’t die from it. It was such a pretty fish. Too bad he had to die, though I suppose he was going to to die anyway from that Lifesaver wrapper. I’m sure that wouldn’t digest very well. Good thing we let all those other fish go. I do have some really great under-water movies of catching fish. I’ll try to put a short one up one of these days. Something mindless and fascinating at the same time. I was trying to sneak five more minutes of sleep so I let Bug play on my laptop and this is what I woke up to. The internet never ceases to amaze me. I’m not sure if that’s a good thing. Spied via Bug.